What is Part 3, section 45, of the Criminal Finances Act 2017? Part 3, section 45, of the Criminal Finances Act 2017 ‘failure to prevent facilitation of UK tax evasion offences” contains a corporate offence for failing to prevent tax evasion. The offence, introduced in September 2017, makes it possible to attribute criminal liability to a corporation for failing to prevent tax evasion. What are the stages to the offence? The criminal evasion by a tax payer (either individual or a legal entity) under existing law. The criminal facilitation of the tax evasion by an ‘associated person’ of the relevant body who is acting in that capacity. The relevant body failed to prevent its representative from committing the criminal facilitation act. Any other person who performs services for or on behalf of the corporation who is acting in the capacity of a person performing such services. It is important to note that the corporate offence will still apply even where there has been no conviction of the individual taxpayer. If an associated person commits a tax evasion offence it is likely to be in a covert manner so HMRC have stated that if reasonable prevention procedures have been put in place, the corporation will not be found guilty of the offence. Prevention procedures are defined as “procedures designed to prevent persons acting in the capacity of a person associated with the corporation from committing UK tax evasion facilitation offences”. What are the penalties for failing to comply with the Criminal Finances Act 2017? If a corporation is found guilty of the offence in failing to prevent facilitation of tax evasion, the corporation will face a criminal conviction with an unlimited financial penalty. Those working in a regulated sector risk losing their licence or having restrictions placed upon them. Corporations may be prohibited from bidding for public contracts. Corporations may suffer reputational damage leading to loss of contracts/consumers. 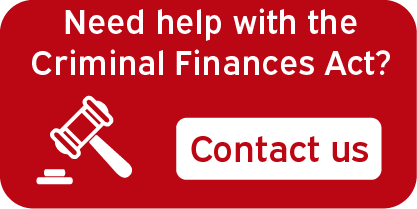 How can Aspire assist you with your Criminal Finances Act compliance? We would recommend that these are reviewed on an ongoing basis to ensure the risk mitigating procedures remain appropriate. Don’t loose sleep. Aspire have extensive experience helping businesses ensure their compliance with the Criminal Finances Act and other related legislation. If you need help, don’t hesitate to contact us today.